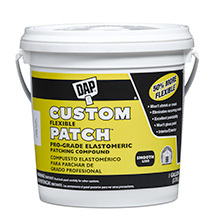 A high-performance, elastomeric pro-grade patching, sealing and bridging compound for repairing recurring cracks in wood, masonry, stucco, drywall and plaster. It is 50% more flexible than traditional vinyl and acrylic spackling compounds to expand and contract with surface movement and prevent cracks from reappearing. Won't shrink or crack. Provides excellent paintability and won't gloss paint. Smooth finish. Interior/exerior use.